Lainie Lovett teach fourth grade in the very rich and very historic Massachusetts town of Rockford and plays soccer in a women’s soccer league. When she finds out her teammate’s husband, a home construction tycoon, had been killed at one of his job sites she just couldn’t believe it. She drives by the site on the way home and sees the crime scene tape all around the home. She also is questioned by the police about her reasons for being there. Who knew checking out where someone was killed would land you at the top of the suspect list? So, who pulled the trigger of the nail gun that killed construction tycoon Arthur Cavanagh? His widow, who’d sworn to kill him if he ever cheated on her? His hostile teenage son, who felt neglected by his father? His foreman, who’d regularly fought with his boss? The angry environmentalists, protesting his latest development? Or the blond mystery woman who’d been seen with him the night of his death? Lainie has to find out to get her life back. Her students and her team need her!! What a wonderful start to a new cozy series. Lainie is a terrific main character. She is easy to like and care about. We know she is a dedicated teacher that really cares about her students and will go the extra mile to help them strive. I am a bit jealous of her athletic ability but her regimen really impressed me. She also has a way of getting to the bottom of things and following clues even if it means putting herself in danger. She also has a vulnerable side as she takes steps reentering the dating game after her husband passing away a couple of years ago. There are also several supporting characters like Lainie’s daughter, Karen, who has moved home after college and is having some dating issues herself. Peter, one her husband’s law partners, who comes to Lainie’s rescue when the cops start to really believe she was in on the murder. Bill Stavic, who dropped into Lainie’s life just in time to bring her a lot of grief and a bit of pleasure. Plus there are Lainie’s soccer teammates who know the gossip and the truth and most of them are her friends. There is so much room for all of them to grown in future installments. Arnold also crafted a great whodunit that kept me guessing to the very end. I really enjoyed this story and am looking forward to see what kind of trouble Lainie gets herself into next. I do caution there is strong, adult language in this book so it may not be everyone’s cup of tea. 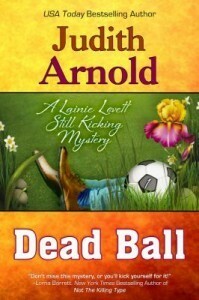 You can find out more about Judith Arnold and her books here. Thanks for the warning. I usually don’t like books peppered with “adult language”. Otherwise it sounds like a good read. Sounds like a great new cozy series. Thanks for letting us know about it. And thanks for the heads up on the language. I don’t mind it, but it’s nice to know about it in advance so I’m not so shocked about it.